Jack Dennis is one of the "Original" fly fishing professionals, someone who's really done it all. Having spent 47 years in the business thus far, Jack has founded sporting stores, ski ships, fly fishing guide operations, and a highly successful book and video productions company; Snake River Press. First starting in the business as a fly fishing guide, Jack used his guide sense and knowledge of fly tying to author and publish the best-selling fly tying books of all time, then turned them into over 50 widely acclaimed DVD titles. Other accomplishments he's proud of is; hosting TV shows, coaching the USA Fly Fishing Team in world competitions, and serving as an adviser in fly fishing travel development for the governments of Australia, New Zealand, Argentina, Chile, and Canada. Jack also founded the Jackson Hole One Fly Event some 29 years ago. This event has raised and donated over 10 million dollars to streams restoration over the years. Serving as Chairman for the successful Headwaters Wild and Scenic Bill gave Jack a legacy beyond fly fishing, by providing protection to over 25 wild trout streams and rivers. The Federation of Fly Fisherman bestowed him with "Legend of Fly Fishing" and "International Ambassador" awards, and Outside magazine named his fly fishing outfitter service the best of the best. As a lover of all things fly fishing related, Jack has helped in developing many fly fishing products from flies, waders, clothing, float boats, leaders, and fly lines. But his first love is fly casting and the rods that make if happen. He teams up again with his old friend Trey Combs, the Steelie and Ocean Master, on a magical journey for the perfect rod. "I am proud to represent a company who truly understands rods and their flexes. Only true masters build masterpieces without regard to fame and fortune. Trust me, this will be a good journey together." Lani has been fly-fishing for fifty two years and was inducted into the Fly Fishing Hall of Fame in 1997. He entered the international fly fishing travel business in 1976, and he has booked and hosted trips in both fresh and salt water environments for forty years. His hosted trips and itineraries in salt water include both inshore and offshore species, from bonefish, tarpon and permit, to tuna, marlin and sailfish in Mexico, Costa Rica and Belize. He currently leads a group to Andros Island in the Bahamas for trophy bonefish and a second trip to Silver Hilton Steelhead lodge on the Babine River for trophy steelhead. His fresh water experiences range from the continental U.S., to Argentina, Canada, Alaska, New Zealand, Russia and beyond. Lani’s articles and stories have appeared in all the major fly-fishing publications and he has held editorial positions for Fly Fisherman Magazine and Wild Steelhead and Salmon Magazine. He serves as consultant to Burkheimer Rod Co, and Rio Line Co. He has also written two books- “A River of Dreams,” published by West Rivers Publishing in 2004, and “A Steelheader’s Way published by Stackpole Books in 2009.” A third book will be released in the coming months, and a fourth is underway. His three award winning videos done in 1984 for Scientific Anglers 3M on steelhead fishing have become classics and are considered the most accurate and complete treatment of the subject ever done. Lani is a founding Director of The Babine River Foundation and is active in British Columbia watershed conservation politics. In addition, he was a founding Director of British Columbia’s North Coast Steelhead Alliance. Denise has been involved in fly fishing, flycasting and steelhead guiding for most of her adult life. It is truly her passion. She started fishing as a kid when her dad would take her with him on the lake. However this wasn’t very often as she was catching all the fish. Fast forward to newly married when her husband, Mike, would disappear after work to fish the Bow River. This was the impetus for both of them to take the Fenwick Fly Fishing School in West Yellowstone, Mt. The school was run by Frank & Gladys Gray. Mike & Denise fished around the world, from Chile, Argentina, Tierra del Fuego, Florida, and the UK. In their travels, they visited many fly shops around the world and met many well-known fishing personalities. A friend introduced them to steelhead fishing on the Kispiox River and they were hooked! Going back every year to fish, they bought some property on the Bulkley River and learned to love it and fish it. This led to guiding other anglers on the Bulkley River. Denise loves helping other anglers catch steelhead. They owned a fly shop for a few years, manufactured both single and double-handed rods, taught flycasting, speycasting, fly fishing and steelhead fishing. Together they promoted the use of double-handed rods in North America. Mike wrote a book called ‘The Art & Science of Speycasting’, and they produced many teaching videos on flycasting, flytying, speycasting and speyfishing. Denise was involved in some international casting competitions in the early years and won a few medals but when the competitions interfered with the steelhead season, it was an easy choice and steelheading won. Here is my one-sentence bio: Jay is passionate about all things related to fish and fishing. I’m fish biologist fly tyer; angler; writer; photographer; artist; teacher; storyteller; mentor; and life-student. My heart pounds every instant I’m on the water with something pulling back on the end of my line. I’m also husband, dad, grandpa, retired, working, and continually wrestle with the elusive concept of “balance” in life. My professional career as a fish biologist with the Oregon Department of Fish and Wildlife spanned four decades, and fit quite naturally with my fishing interests. A Wild Salmon Hall of Fame Inductee in 2006, I retired from the Oregon Department of Fish and Wildlife in 2007to work as the senior Salmon Scientist at the Wild Salmon Center; retiring finally by 2014. Professional recognition received includes induction to the Wild Salmon Hall of Fame; Oregon Trout’s Fishery Scientist of the Year; Oregon Steelheaders Annual Fishery Scientist; American Fisheries Society Fishery Worker of the Year; Governor’s Leadership Award, and Oregon Fish and Wildlife Researcher of the Year; not necessarily in that order. I’ve fished for six decades; tied flies for more than five decades; produced hundreds of YouTube fly tying videos; and currently provide encouragement and mentoring to promote fly fishing, fly tying, and salmon conservation. My days are full to the brim – fishing somewhere on the coast, tying flies, creating instructional videos, writing, sketching, and mentoring people with similar passion for fly fishing and conservation. You’ll find my reports on the Oregon Fly Fishing Blog, and I’m honored to contribute to several fly fishing magazines here and in Japan. Finally, I‘ve published over ten books on Amazon, a portfolio of writing that spans science and art, from serious to silly, with fish and fishing as unifying theme. Whether floating the Deschutes River, wading spring-creeks, or kicking along in a float tube, Judith O'Keefe is at home with a fly rod in her hand. Even though one of her favorite places to cast a fly is right in her own backyard - the small desert streams of eastern Oregon, Judith enjoys fishing the beautiful chalk streams of England, hunting for brown trout in Chile, and exploring Florida, the Bahamas, Nicaragua and the Yucatan while stalking bonefish, permit and tarpon. She has logged serious time on Baja's Pacific and eastern coasts and has also spent time in the back country of Alaska looking for giant trout and salmon. In 2010, Judith started an angling destination and hosted travel company, Streams to Sea, LLC. Stream to Sea also offers introduction to fly fishing and angling photopraphy workshops. While destination travel, hosted trips and classed are open to all, couple and women's groups are a special focus. She has spent many years traveling to various locales around the world happily photographing fish, anglers, the local culture and scenery. Jutidth also collaborated with Scientific Anglers on two instructional DVD's; Fly Fishing Made Easy and Introduction to Fly Casting. Judith is honored to be one of a hand-picked number of women featured in the American Museum of Fly Fishing's recent exhibit, A Graceful Rise; Women in Fly Fishing, Yesterday, Today and Tomorrow. She is a regularly featured guest blogger on Filson Life, and is a current member of the Board of Directors for the International Women Fly Fishers. She also serves as the vice President of the board of her local chapter of Trout Unlimited, is a founding member and co-chairman of Slow Food High Desert, an affiliate of Slow Food USA, and supports Casting for Recovery and Project Healing Waters with her volunteer efforts. After learning to fly fish as a kid, Steve spent many migratory years as a student learning the ways of Catskill's trout, New England Stripers, and remote watersheds of southern Chile. Eventually he found the right gravel in the steelhead rivers of the Pacific Northwest, where for the past 15 years he's been immersed in both traditional and modern two-handed angling techniques. Known on his local waters as a spey ninja, he's always willing to share casting and fishing tips, but disappears without a trace when there's fishing to be had. Andre was born in 1978 in Schwerte located on the river Ruhr 10km away from the city of Dortmund. He started fishing for pike at the age of six during a summer holiday in Sweden. A year later he and his parents visited the famous Swedish Salmon River Mörrum where he admired the grace of swinging a spey rod and catching big Atlantic salmon on the fly. From this moment on he had to be a “fly fisherman” and never touched a spinning rod again. During his entire youth he spent his summer holidays on Scandinavian salmon rivers and soon became a good caster and fly tier. Being good in playing Handball and fly fishing he had to decide whether to become a professional Handball player, or spending his free time on the riverbank. Andre studied at the Ruhr-University of Bochum and he got a Bachelor degree in “Sports Science”. If not teaching at school Andre is teaching spey classes throughout Germany and Europe and if time allows through parts of the US as well. Having spent more than 30 years casting with spey rods and fishing for Salmon, Seatrout and sporadically for Steelhead he garnered much knowledge of the sport which he is always willing to share with his students. In the past two decades Andre has also worked with several fly fishing companies like Flyfishing Europe, Vosseler Reels, Nautilus Reels, and the Norwegian Flyfishers Club (NFC). He helped design products, did casting and fly tying demos throughout Europe and the US, along with organizing and hosting destination trips. He has also written several articles for German fly fishing magazines and has an Atlantic salmon fly collection with Rainy’s Flies. Andre has fished many places in Europe, parts of the US and Canada. Since Germany has only trout fishing to offer, Andre still spends most of his salmon fishing time in the summer on the prolific beats of the NFC on the river Gaula in Norway or you will find him chasing Atlantics on other Norwegian, Swedish, Scottish or English rivers. Chris, or Grizz as some call him, found a love and passion for fly fishing at an early age. Always eager to explore and learn, he cut his teeth on the diverse waters of the Wasatch Front, then sharpened his skills on the famous waters of Idaho, Montana and Wyoming. By necessity, his love of chasing trout spawned a lifelong addiction to tying flies and his creations, creatively, are both simple and effective. Chris has worked within the fly fishing industry for over ten years with stints at the legendary South Fork Outfitters and five years managing the fly shop operations for TroutHunter on the Henry's Fork. He now spends his summer seasons guiding the waters of the greater Yellowstone area for TroutHunter. His other contributions to the industry come in capturing the artistry of fly fishing, and everything it encompasses, through writing and photo work. A huge fan of the solitude our pastime offers, and forever an angler with an adventurous spirit, Chris is always seeking out a new stretch of water and fresh fish. Believing strongly in the protection of a resource which provides him joy, he conducts himself on a foundation of conservation, tradition and the strong principles of angler ethic, never taking for granted the beauty of healthy wild trout or their habitat. A lifelong dry fly junkie at heart, Chris now resides on the banks of the Henry's Fork, in Island Park, Idaho with his beautiful wife Kristen and their trusted bearded collie "Nacho'. Skiing, hunting, writing and dreams of steelhead fill his time when away from his area waters. "I geek out on the tough Rainbows of the Railroad Ranch, the Burkheimer DAL series really lays it down with the strength and accuracy I desire. Not to mention, they look damn fine doing it!" Growing up in the Pacific Northwest Filmmaker and Angler Shane Anderson has had a passion for the outdoors and fly fishing. A former professional skier turned fish lover. Shane started is film career in Hollywood then migrated to Northern California to chase steelhead and study fisheries biology at Humboldt State University. In 2012 he founded North Fork studios to combine his passion for the outdoors and nature with visual storytelling. He has completed two Award winning films: Wild Reverence and Behind the Emerald Curtain and has made several videos focusing on fisheries conservation for: Trout Unlimited, Wild Steelhead Coalition, Wild Fish Conservancy, Pacific Rivers and produced the Outside the Fly Box Webisode Series for CF Burkheimer. Being the Nephew of Kerry Burkheimer, Shane has been testing and fishing Burkheimer rods since the beginning. His favorite rivers are the Eel in Northern California and anywhere on the Olympic Peninsula. His 8134-4 “Blue Steel” is his rod of choice for big Wild Winter Steelhead and the new 6128-4 is unmatched for Summer Steelhead. Cutting his river teeth on the Animas and countless small creeks around Durango, Colorado -- and skipping countless classes to do so -- John Campbell moved to the Yellowstone region in 1997. He worked several summers at Bud Lilly’s Trout Shop learning the waters of the Park and Southwest Montana. Since 2007, John has been with Trouthunter on the Henry’s Fork where he loves to help anglers of all experience levels find their place in fishing. Be it casting, knots, tying, trout, salt or steel, he’ll make it happen. John teaches high school English and coaches soccer in Texas nine months out the year, and when he’s not grading papers you can find him chasing redfish, smallmouths, ducks, picking a guitar, and hanging with his Golden Retriever pup, Ghillie. But really, it’s about early June and the truck pointed north to Trouthunter and “The Fork” that gets him excited. Getting to feed the dry fly junkie at heart for 60 straight days. Jeff Cottrell is a guide, fly designer and lodge manager, currently heading the Evening Hatch upper Columbia operation along with Jan, his talented wife. Jeff is a Rainey’s Flies signature designer and member of the Burkheimer pro staff. His nearly forty years of guiding experience spans several continents. Jeff, Jan, and an eclectic collection of dogs and cats, live beside the Klickitat River, in Washington State. An avid fly angler for over 25 years, Kevin began fly fishing the smaller creeks of northern Utah, but soon felt the desire to expand his fishing to other states and larger rivers. He quickly fell in love with the famous waters located throughout the western United States and developed a real soft spot for the technical dry fly waters of the Henry's Fork. Upon these waters, Kevin sharpened his skills to become known as a superior fly angler among his peers. In 2011, Kevin began a guiding career with TroutHunter on the Henry's Fork and quickly earned the reputation as a fantastic teaching fly fishing guide. One of his specialties is getting his clients into the tough and technical trout of the famous Railroad Ranch. The Ranch was also where he discovered the function and soul of Burkheimer fly rods. Realizing the importance of conservation and giving back to the resources that provide him limitless enjoyment, Kevin is a member of the Henry's Fork foundation and the Utah Stream Access Coalition, among other things. Through TroutHunter, he also provides trips with wounded veterans via the Higher Grounds organization. He resides in Island Park, Idaho year around and spends his off seasons hunting, keeping up on sports and enjoying many other outdoor activities. Peter Gadd started fly fishing at the age of 10 on the American River in Northern California. His dedication to the sport was evident after a year of skipping lunch to save his lunch money to buy afly rod in 6th grade. He has been guiding for over a decade, specializing in Steelhead in the Pacific Northwest, where he can be found gently improving his client's technique and making dry jokes. Peter's love of fly fishing has taken him guiding across North America. His favorite book is "Farewell to Arms" and his favorite food is Red Vines. As a Master Casting Instructor certified by the International Federation of Fly Fishermen (IFFF), Willy teaches casting at the golden Gate Angling and Casting Club in San Francisco's Golden Gate Park, as well as at the Diablo Valley Fly Fishermen's Club. in Walnut Creek, California. The Certified Master Casting Instructor is the highest level of accreditation from the IFFF and they have been trained, tested, and certified to be effective teachers of fly casting. Willy also directs casting instructions for the IFFF in Northern California. As an avid outdoorsmen, Willy has been fly fishing for four decades and he enjoys sharing his passion for the sport with others. As a result, Willy has taught hundreds of fly fishing students from beginner to advanced over the years. He also instituted the perennially popular Novice Fly fishing Program for the Diablo Valley Club back in 1984. Willy can often be found at the Golden Gate casting ponds in San Francisco conducting casting lessons for individuals as well as large groups, sometimes numbering up to 100 students. He mentors future casting instructors though a CE Prep Program at Golden Gate which trains participants to be both better casters and better casting instructors. Willy is an accomplished fly fisherman in both fresh and salt water, in the US and internationally. He has caught and released many trophy sized game fish including multiple varieties of trout, bass, striped bass, steelhead, Atlantic & Pacific salmon, muskie, pike, walleye, shad, tarpon, bonefish, redfish, snook, and trevally to name just a few species. Hale Harris grew up fishing the trout streams and rivers of the Rocky Mountain west. He has decades of experience guideing anglers in Alaska and Montana, and his articles have been published in several fly fishing magazines. Currently, he is the co-owner of Bighorn Trout Shop in Fort Smith, Montana, one of the premier fly shops and lodges on the world-famous Bighorn River. He has a passion for rising trout, big Alaskan rainbows and steelhead on a two-handed rod. A talented caster, casting instructor, angler and guide, Nate has dedicated himself to steelhead and salmon angling with the fly. He has been featured in books and magazine articles, given casting presentations from California to New York, traveled extensively to fish for steelhead and salmon, penned articles for the fishing publications, and appeared in two-handed casting instructional videos. A native of Oregon's coast range, John Larison has been obsessed with all things chrome since the age of seven, when he first saw an ocean-charged steelhead lifted from a blue-green pool. Fly fishing by age eight and guiding by twenty-two, John now specializes in teaching anglers to catch winter steelhead on the swung fly. He focuses his guiding on Oregon's mid and North coast. In addition to guiding, John is also the Northwest Field Editor for Fly Fisherman Magazine and a frequent contributor to The Drake, Fly Fish Journal, Fly Rod & Reel and other outdoor publications. He writes Fly Fisherman's Spey Today blog, where he reports conservation news, reviews new tackle, and offers tips for more effective fishing. John is also the author of three books on steelheading, included a how-to book The Complete Steelheader, and the novels Northwest of Normal and Holding Lies, which the New York Journal of Books called "an exceptional piece of literature disguised as a book about fly fishing. In 2009, John became a River Steward for the Native Fish Society, and continues to advocate for native steehead and salmon on the Oregon Coast and throughout their historic range. "I started fly fishing at the age of 11, since then I have spent time on small creeks to big salmon rivers when ever and where ever possible. I fell in love with spey casting competitions in 2011 at Spey-O-Rama while I was studying opera singing in San Francisco. I became a very dedicated caster and was soon experiencing solid results in competitive casting competitions. I won the Nordic Championship in 2013 at the 15'1 series. I am a firm believer of good casting techniques and it's benefit for fishing. If Gregg is not in the shop or guiding you will usually find him with his wife Dana and their Australian Shepherd, Tuukka on a late afternoon float down the Clark. If you are passing through the Idaho Panhandle along I-90 stop by the shop and say howdy in Historic Wallace, Idaho. Or email him at wallacedriftboats@gmail.com . Bucky McCormick grew up fishing the small streams of the est and made his first pilgrimage to Montana in 1989. After that first trip and many others the pull became too strong and he make West Yellowstone his home. John was raised along the banks of the Washougal River in Southwest Washington where he spent most of his youth fly fishing for trout, steelhead and salmon. His favorite fish were the summer steelhead, from the early June rains through the late Indian Summers. All other interests were set aside during this period. Only steelhead mattered. His early interest to steelhead carried over to adulthood. He has lived much of the past twenty years on the west-side of the Olympic Peninsula, and for a decade he fished an average of 340 days a year. He spent that time adapting a style of casting and fishing in isolation -- wading deep, casting far, and swimming the fly broadside rather than solely swinging -- to solve the unique challenges of catching large winter steelhead in the brawling rainforest rivers. He also spent 100's of days snorkeling the rivers, not only to inform his angling but also because he is a fisheries scientist. He has published numerous peer-reviewed articles in scientific journals, the vast majority of which has focused on the biology and ecology of steelhead and rainbow trout. In addition, he has authored two books and several book chapters on steelhead and other topics, and his underwater photography and videography has been broadly published in books, magazines, newspapers, movies and television. His latest publication is the book May the Rivers Never Sleep, which was a collaboration with his father Bill McMillan and pays homage to the strong conservation influence of Roderick Haig-Brown. He now works as the Science Director for Trout Unlimited's Wild Steelhead Initiative after spending the previous five years studying steelhead and salmon recolonization in the Elwha River. Ever thankful for his understanding and lovely wife, Laurel, and his sidekick Gordon Setter, Honey, much of his free time is spent casting Burkheimer spey rods, snorkeling and taking underwater photographs of juvenile and adult steelhead. Steve grew up in southern British Columbia and has been fishing from a young age. Eventually he moved to the British Columbia interior to pursue an education in fish and wildlife management, journalism and environmental science. Over the last 12 seasons he has had the pleasure of working on rivers near his home like the Harrison and Fraser, on fabled trout streams like the Chilko and even in Patagonia. He currently has the good fortune of working as a steelhead guide on the creeks of Haida Gwaii and the Dean and Bulkley Rivers. Bit by the bug 24 years ago, Yassy spent his preliminary years on the fly chasing down rainbows and salmonids in the rivers of Japan. His business and work experience lead him to Norway which opened up the doors to the world of spey casting and Atlantic Salmon in particular. Yassy has had the opportunity of crossing paths with Ian Gordon, his mentor in spey casting, who has contributed to building up strong fundamentals for distance casting. Today, Yassy passes on his knowledge to the future spey fishermen of Japan as he guides them towards his new found passion of steelhead. If Jason could make a good enough living at fly fishing to support his sybaritic angling lifestyle he would; he can’t, so instead he loans people money at exorbitant interest rates. In other words, he is a banker. Since most of his time is spent either contemplating new fly fishing techniques, how he can become better at the techniques he already knows, or actually putting those techniques into practice catching more fish than the buddies he fishes with, it’s difficult to know when he finds time to even balance his own checkbook, much less balance the bank’s books, but he does. Jason has an interest in all kinds of fly fishing quarry, so long as that quarry is trout, or at least of the onchorynchus or salmo genus. If forced by his friends he will acquiesce to swing a classic fly on an autumn steelhead river. For trout Jason prefers the dry fly, which is why his nickname is, “Mr. Drysdale,” a nod to both his favored technique and profession. Jason--Mr. Drysdale-- had to have a friend write this bio, as he heard that there might be a few skwalla stones hatching on the Yuba River today and he wants to be the first angler to get a skwalla dry fly eat on that river. On top of all that, Jason has one of the prettiest casting strokes this side of Joan Wulff. This fact is probably due to the fact that when he isn’t on the river and is supposed to be banking, he is on the roof of the bank practicing his casting. Sometimes Jason can be found behind the counter at Fly Fishing Specialties in Citrus Heights. Ostensibly he is there to help customers, but actually his presence there is mostly for reconnaissance to wheedle info from the more informed clientele. Ryan has been a lifelong Northwest angler, and has found the most rewarding fishing is located within a short drive from his home base of Seattle, Washington. Surrounded by both fresh and saltwater, he targets sea-run cutthroat and salmon off the beaches along with steelhead, trout and salmon in the rivers. After growing up in Oregon, Ryan fled to the Colorado snow and emerged with a degree in biology. Every fishery has a perfect tool for the job. Personal favorite trout rods are the CF590-4, CF389-4, and CF690-4 Seatrout. For steelhead, the 7134-4 and 8139-3 are never left behind. Contact Ryan for more information on the spectacular fisheries in his area. Ryan is available for guided trips, fly tying lessons, presentations and casting clinics. 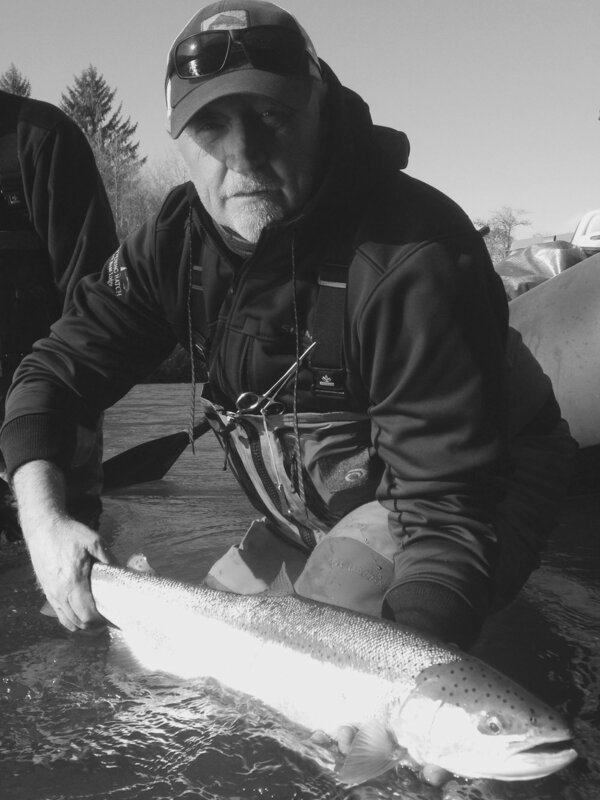 At the age of 17 years, Dave decided steelhead were the fish to catch. Not only attracted to the fact that they were big fish in brawling rivers, but the flies used to fish for them were attractive as well. Especially the ones Dave himself tied. Inspired by the late Syd Glasso, Dave has been tying steelhead flies for 38 years. His flies are available commercially and are by far the best available anywhere, Period! His passion for fly angling has taken Dave down many paths, from owning a retail fly shop in Boise to working as a full time guide on some of the best rivers the west has to offer. Grande Ronde, Hoh, Sol Duc, Bogachiel, Salmon, and Owyhee rivers to name a few. In his guiding he’s had senators, ambassadors, media personnel, entertainers, CEO’s and hundreds of “Everyday Anglers” in his boat. All of them ending the day smiling and more educated on what rivers and the fish in them want and need. Dave’s first guiding job entailed back country Llama pack trips into Alpine lakes fishing for trophy rainbow’s, cutthroat, and brookies. He also guided wilderness horse pack trips for cutthroat fishing and hunting for Deer and Elk. Dave’s passion for chasing selective fish has honed his fly fishing skills well. He is seldom stumped by fish in any water. Ryan is the owner/operator of Whites Guiding Company and offers conservation minded fly fishing trips on Vancouver Island. It warms his soul being able to share in others successes. Whether it's helping them cast a perfect loop, catching their first steelhead on a dry, or learning to tie classic steelhead flies, it's why he teaches and guides. Ryan is equally at home tossing dries on a single hander or throwing classics on a two hander working a long line. He spends the summer guiding anglers looking for that fish of a lifetime. In the Fall he’s flying around in a helicopter throughout Northern BC in search of big aggressive steelhead. Late fall and Winter is spent guiding steelhead on remote Vancouver Island coastal streams, with some much needed time to catch up with his wife and three lovely daughters. When not guiding Ryan can be found at the Cumberland Fly Shop teaching fly tying and casting. You can reach him at rywhite74@gmail.com or whitesguidingcompany on Instagram.